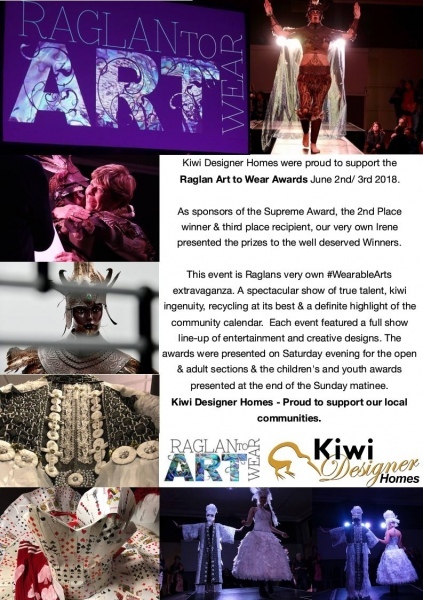 Kiwi Designer Homes were proud to support the Raglan Art to Wear Awards June 2nd/3rd 2018. As sponsors of the Supreme Award, the 2nd Place Winner & 3rd place recipient, our very own Irene presented the prizes to the well deserved Winners. presented at the end of the Sunday matinee. Kiwi Designer Homes / Kiwi Transportable Homes- Proud to support our local communities. Normal Opening Times: 8.00am -4.30pm Mon to Fri.